So when the company we work for stepped into the water rights and land value space, we naturally reached out to each industry – real estate and lending – and found a common interest in the topic. We’ve learned a lot from our real estate and lending clients on how they use our Water Sage platform in order to educate their clients. Education is key. It’s naïve to assume a property has water rights just because you see water on the land. Even if there are ponds or irrigation on site or a stream running through it, there may not be water rights associated with that property. Land can be irrigated with water purchased from a water user or ditch association, with water from an unauthorized diversion or through a private agreement with a neighbor. If you allow a buyer to unknowingly purchase a property with illegal water, you undoubtedly will hear from the unhappy new owner. And, for lenders who don’t know what rights are on a piece of land, you could be over- or undervaluing property. Understand the entire picture. Water rights can be one of the most valuable aspects of a property. If, or how, those water rights are tied to a land parcel can mean all the difference to that value. It could spell potential financial loss to a buyer, his broker and his lender if the water rights have been severed before the purchase, or it could be a potential gain if the water rights are undiscovered. After all, water rights are like private property rights and can be bought, sold or transferred. Our ag lender clients have told us that they are able to lend 10 to 20 percent more against land parcels because the platform allows them to better understand the water rights associated with that property. Know your market. There are myriad ways to research water rights. It can feel a little like finding the proverbial needle in the haystack. Every state has its own means of sharing public data. For example, some states have open databases that can be searched online. Other states require a trip to the courthouse to search through paper files. Mitigate risk. 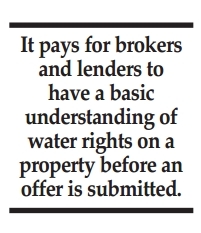 Because a sale could fall through if due diligence reveals substantial water right defects, it pays for brokers and lenders to have a basic understanding of water rights on a property before an offer is submitted. There may be several reasons why you can’t find water rights. First, the record for your water right may have a typo or a misspelled word in the name. Second, the water rights may not have been transferred when the property last sold or was put into a trust or corporation. Third, maybe a previous buyer or seller didn’t correctly update the ownership records following a previous transaction. This is all beneficial information to provide to the client – as important as identifying a water right. Whether you are the agent representing the buyer, the listing broker for the seller or the lender fueling the deal, you don’t want to miss important information about the water and water rights used on a property. Prior to showing a property, familiarize yourself with the streams and ponds on or near the property, or water used by the seller and create a water rights report for the buyer. Understand which water rights irrigate various fields and fill ponds and reservoirs. You might even want to see how many upstream water rights are diverting out of an adjacent stream that adds aesthetic or recreational value to a property. These precautions can help you and your client avoid costly and time-consuming surprises. Use tools to help. Although water rights are critical to land value, they are sometimes overlooked, exposing both buyers and sellers to unforeseen risks. With the right tools, real estate agents and lenders can be sure to provide accurate, detailed information on water rights quickly and efficiently.